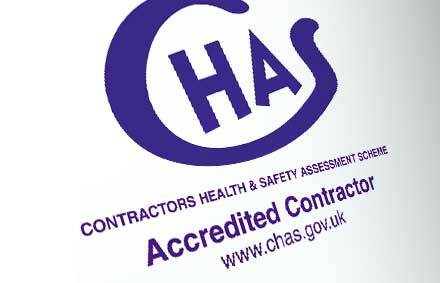 CHAS Certificate of Accreditation for Vanda Coatings. We are pleased to announce that Vanda Coatings has been given a CHAS Certificate which endorses our reputation for upholding an extremely high standard of health and safety in every aspect of our service. The Contractors Health and Safety Assessment Scheme (CHAS) Accreditation has assessed Vanda Coatings regarding our health and safety policy statement and our organisation for health and safety. As a supplier, CHAS has verified that the standard of our health and safety arrangements are acceptable to buyers of our service and others. We have demonstrated compliance with essential aspects of health and safety law and we also have approval to supply our service to all CHAS’ buyers. CHAS was developed in 1997 in order to improve the national standards of health and safety and to reduce the duplication of safety applications. Before CHAS was established, some buyers may have deemed a service acceptable in terms of health and safety, but not others whereas now there are fewer inconsistencies. This saves time and resources for everyone involved in procuring and supplying a service. Now CHAS is the biggest and fastest developing safety assessment scheme in the UK with 570 buyers and more than 50,000 suppliers and we are happy to be one of those suppliers. As a member of CHAS we are proud in being able to officially assure all buyers of our devotion to health and safety in all aspects of the process of providing our specialist service. The CHAS assessment was extremely thorough and involved 3 stages. The initial stage demonstrated that Vanda Coatings can manage health and safety to the required level. The next stage of assessing Vanda’s competency focused on our capability, experience and resources to complete the work we set out to do. Specifically, this includes method statements, specific risk assessments, references, examples of previous similar work, training and available resources. The final stage passed by Vanda Coatings showed us to be proficient at safely managing the work, carrying out the method statements properly, having enough resources, liaising properly, managing the site effectively and providing enough supervision. A buyer wishing to use Vanda Coatings can be confident that they will be purchasing a professional service and that an extremely high standard of health and safety will be adhered to at all times. Consequently, any buyer does not have to waste time and resources researching our health and safety record. Obviously, any supplier would expect a buyer to monitor the work being carried out in terms of health and safety in order to ensure their staff and any personnel involved in the project are protected, but any buyer can rely on Vanda Coatings to carry out projects with the utmost care. We pride ourselves in our high standard of service and it is our experience as well as our consistent attention paid to health and safety that have kept us at the forefront of electrostatic paint spraying throughout the UK.